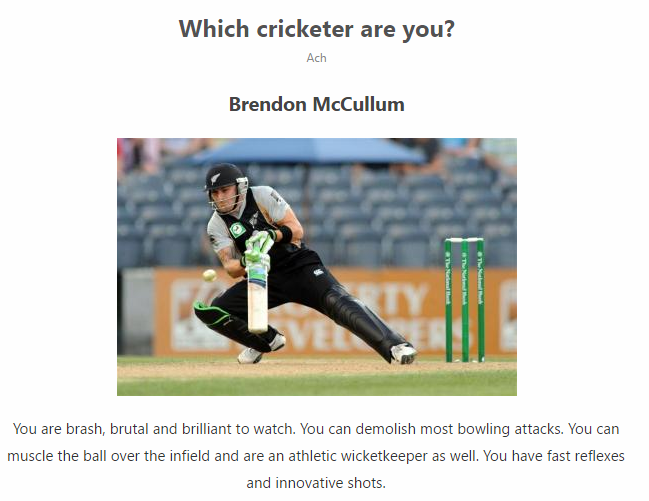 Here are two links to quizzes about which cricketer you are! Take the quiz and post your results on here! Try it out @Square Drive @Hasan123 @aloo paratha @Varun @Statsman @#GreenRoars @shaz619 @Belawal2014 @street cricketer Then post your results here! Here's my results!!! Can't believe it one of my 2 Batting idols along with AB! Is this an Aussie-centric site? No But you can use the other link. Tried the other quiz and got Shahid Afridi! I took the second quiz. Selected the options as batsman, pace bowler, batsman + captain, like team India, ignore sledge, involved and serious character, go for aerial shots at 109-6, medium weight and short hair cut. Got Wasim Akram, but I reckon I'm more like Anwar Ali. I think I am like Nasser Hussain. Ordinary in my primary field, but have found great meaning and purpose over the internet. I got Chris Martin, but oh well. Last edited by Arham_PakFan; 16th January 2017 at 21:58. What is this ? I said I am a batsman who can bowl right arm offspin, and they give me jacques kallis ! Last edited by Arham_PakFan; 17th January 2017 at 16:53. Last edited by Ellipsism; 17th January 2017 at 06:36. Hussey on the 1st one , msd on the 2nd. Nice fun thread, got Kevin peterson in the first link, and Afridi in 2nd link, i think it's quite accurate because both of these cricketer are flawed genius, amazing on the field and controversial of the field, but when in the zone they are one of the most breathtaking players who can win the match single handedly. I got Shaun Pollack . Looks Like Pakistan Has Found A Sangakkara For The Future! 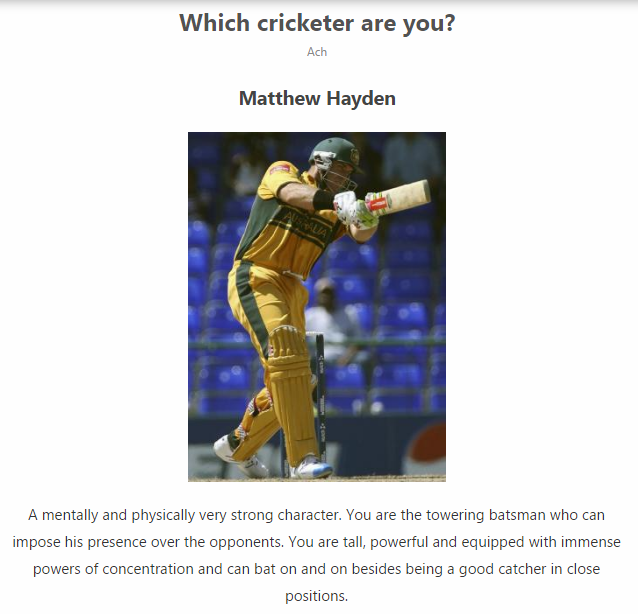 In the first one, I got Shivnarine Chanderpaul. In the second one, I got MS Dhoni. Chanderpaul seems alright as I do have an odd stance but I have no idea how I got Dhoni.